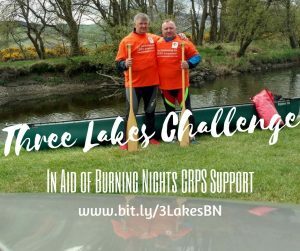 Three Lakes Challenge Fundraiser 2 gentlemen - Graham and Michael - will be taking on the Three Lakes Challenge fundraiser in a canoe in aid of Burning Nights CRPS Support over the next few months. 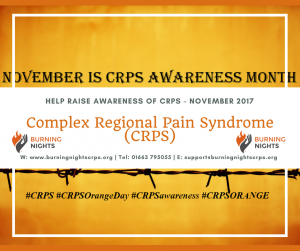 Graham's step-daughter is a Complex Regional Pain Syndrome (CRPS) sufferer and is also one of Burning Nights CRPS Support's trustees. The 2 men will canoe across the longest lakes in Wales, England and Scotland which are: Bala Lake Loch Awe Lake Windermere Three Lakes Challenge - Graham and Michael Their first lake has already been completed at the end of April and they are hoping to complete their second late towards the end of June. Please show your support for these men battling against the British weather by making a small donation to their fundraiser via their Three Lakes Challenge Fundraiser link. GOOD LUCK GRAHAM AND MICHAEL! Last Updated: 22/05/2017 LET'S SPREAD AWARENESS of CRPS!